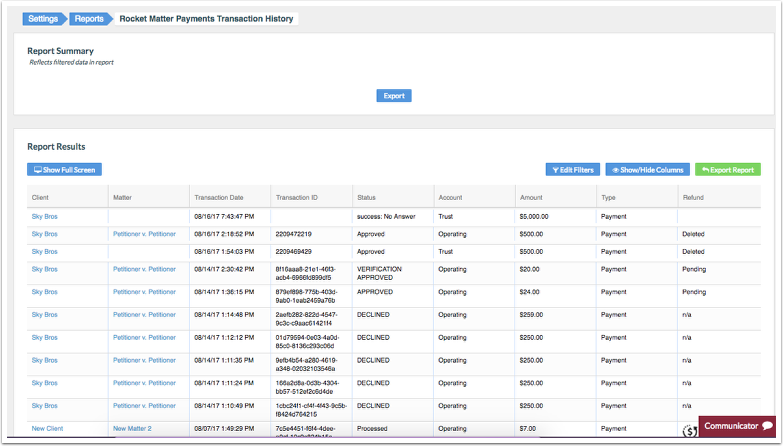 Rocket Matter Knowledge Base LexCharge Integration - E-Check ProcessingHow do I find a report of these e-check payments. As always, you can keep track of all of your online payments through the ‘Rocket Matter Payments’ report. 2. Select the ‘Rocket Matter Payment Transactions’ report. 3. This will show you the status of all credit, debit and E-check transactions as well as which accounts were used in each transaction. Prev: How do I deposit a e-check on behalf of my client. Next: How to setup a automatic payment plan with a e-check.